Olson, Neil. “Letter from international student Neil Olson to BGSU President William T. Jerome.” Digital Gallery. BGSU University Libraries, 1 Feb. 2018, digitalgallery.bgsu.edu/collections/item/17251. Accessed 24 Apr. 2019. 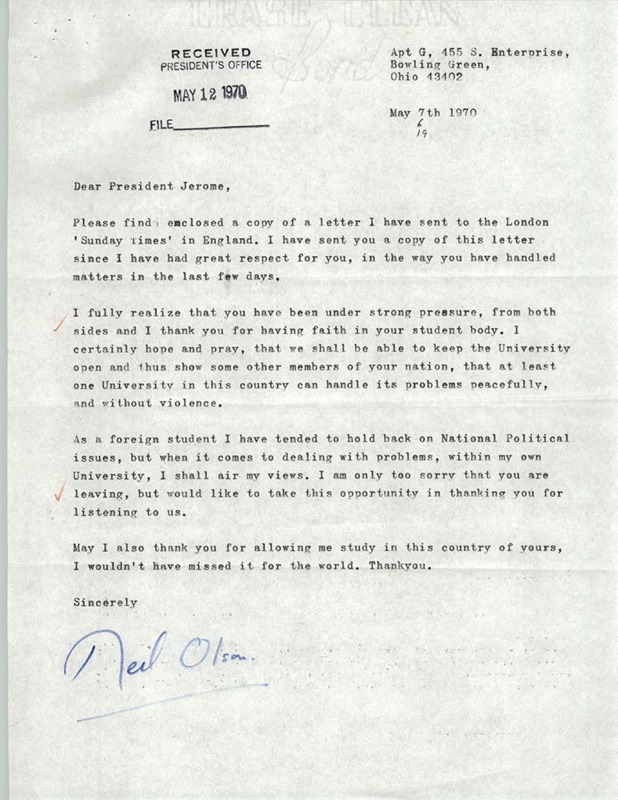 A letter from Neil Olson, an English international student, to BGSU President William T. Jerome; he expresses his support for Jerome's decisions in the aftermath of the killing of student protesters by National Guard troops on the campus of Kent State University in May 1970 and attaches a letter he wrote to the London Sunday Times. Please find enclosed a copy of a letter I have sent to the London 'Sunday Times' in England. I have sent you a copy of this letter since I have had great respect for you, in the way you have handled matters in the last few days. I fully realize that you have been under strong pressure, from both sides and I thank you for having faith in your student body. I certainly hope and pray, that we shall be able to keep the University open and thus show some other members of your nation, that at least one University in this country can handle its problems peacefully, and without violence. As a foreign student I have tended to hold back on National Political issues, but when it comes to dealing with problems, within my own University, I shall air my views. I am only too sorry that you are leaving, but would like to take this opportunity in thanking you for listening to us.